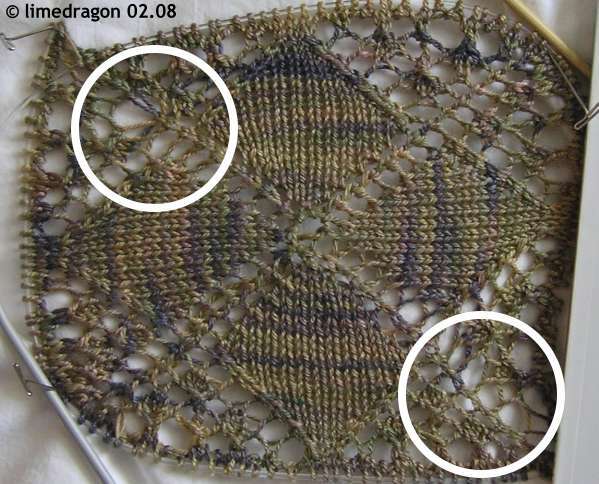 The above photo shows a completed center motif and one pattern repeat. I used US 6 (4 mm) circulars to test the fabric. I was also worried that the color variation might be too busy, but it looks pretty good. I didn’t like using the circulars, though. The lace stretched out awfully between each needle. 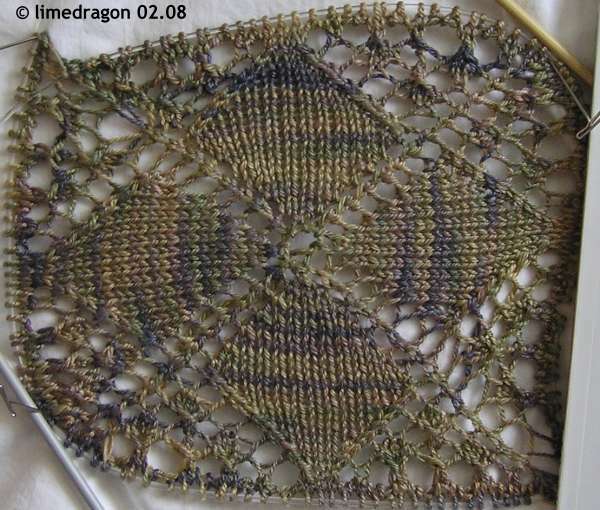 This is most prevalent where the lace triangles start. If you can’t see it in the above picture, here’s another one with the problem areas circled. Ew. Compare them with the much neater cross-axis. The gauge seems a bit flat, so I’m going to try a smaller needle size. I’ve ordered some 10-inch US 5 (3.75 mm) DPNs. I’m hoping to prevent stretched out stitches with the DPNs. Once the square is large enough, I can change to a 24-inch circular. For all the frogging, this yarn has held up extremely well! Lovely!! Definitely not too busy. Do you have two circulars of the right size? That would do the same thing as the dpns. Oh – that is so pretty! Oh that’s gorgeous! I want to knit lace. Lots and lots of lace. Ooh, that’s going to be nice! I like your new blog theme! I like English Crystal. The yarn doesn’t look too busy at all. I think it’s going to look very nice.